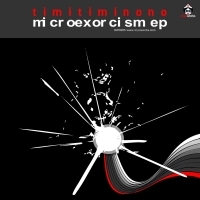 Timitiminono's debut ep marks an important date in the universe of cryoworks. Timitiminono is the part of David Felix's schizoid personality that represents frustration. This portugese musician concocted a deep drony ambience of delectable goodness for us to share with our fellow netizens. The first track is microexorcism of sounds so delicate and intricately woven you'll immediately fall into a blissful coma. The second track invokes a curiosity in the listener, a curiosity which simmers in a bath of sounds and leads you into the light. Best enjoyed latenights with a good sci-fi book.